This printing machine introduce sensitization resin as flexible printing plate, suitable for printing packing materials like polyethylene, polypropylene bag, cellophane and roll paper, etc. 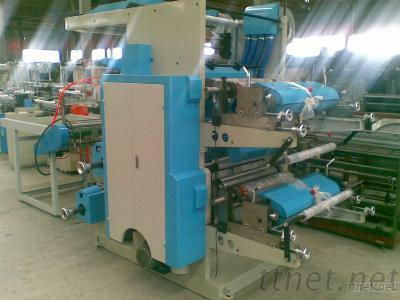 It is a kind of ideal printing equipment for producing paper packing bag for food. 1>. Easy operation, flexible starting accurate color register. 2>. The meter counter can set printing quantity according to the requirement. Stop the machine automatically at the set quantity or when the material is cut off. 4>. The printing ink is spread by the knurled cylinder with even ink color. 5>. Reliable drying system coordinated with high-speed rotation, it will automatically break circuit when the machine stops. 6>. 360 continuous and adjustable longitudinal register device. 7>. The frequency control of motor speed adapts to different printing speeds. 8>. There are inching/Stopping buttons on the plate roller base and material rolling rack so as to make it easy operate the machine when the plate is installed.